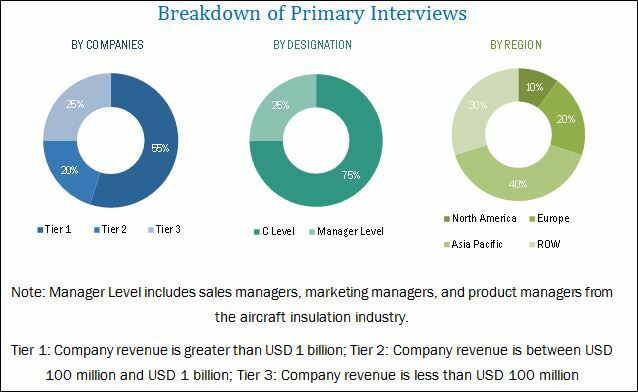 [147 Pages Report] The aircraft insulation market is estimated to grow from USD 7.46 Billion in 2017 to USD 9.89 Billion by 2022, at a CAGR of 5.79% from 2017 to 2022. The objectives of this study are to analyze the aircraft insulation market, along with statistics from 2017 to 2022, as well as to define, describe, and forecast the aircraft insulation market on the basis of type, material, application area, platform, and region. The year 2016 has been considered as the base year, whereas 2017 to 2022 has been considered as the forecast period for the market study. The aircraft insulation ecosystem comprises airline component providers, such as DuPont (US), Triumph Group Inc. (US), Esterline Technologies Corporation (US), BASF SE (Germany), Zotefoams Inc. (UK), etc., and material manufacturers, such as Duracote Corporation (US), Polymer Technologies Inc. (US), Morgan Advanced Materials (UK), InsulTech LLC (US), Zodiac Aerospace (France), etc. 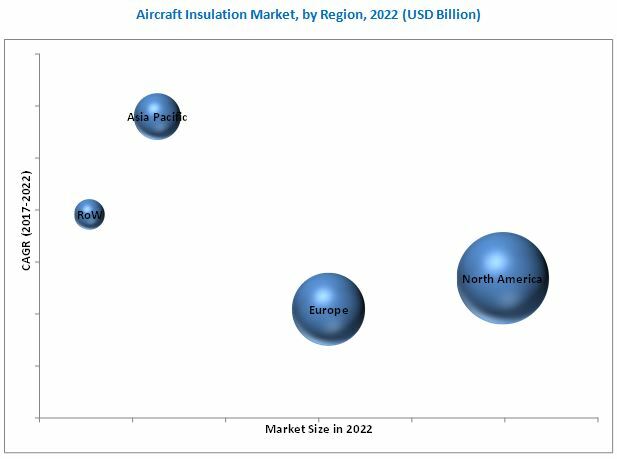 The aircraft insulation market is projected to grow from an estimated USD 7.46 Billion in 2017 to USD 9.89 Billion by 2022, at a CAGR of 5.79% from 2017 to 2022. Increase in demand for lightweight insulation materials, introduction of advanced acoustic and fire resistant materials resulting in safer operation of aircraft, declining cost of composite materials, and increase in commercial aircraft deliveries and passenger traffic are the key factors that are expected to drive the aircraft insulation market. The aircraft insulation market has been segmented on the basis of type, material, application area, platform, and region. Based on type, the aircraft insulation market has been segmented into thermal insulation, vibration & acoustic insulation, and electric insulation. Increasing use of materials with low thermal conductivity helps to reduce the transfer of heat between different aircraft components and parts, and ensures high level of safety during aircraft operations. Thermal insulation systems help maintain a comfortable internal environment while the aircraft is in flight, and dramatically reduces noise levels and vibrations. Based on material, the aircraft insulation market has been segmented into foamed plastic, fiberglass, mineral wool, ceramic-based material, and other materials. Based on material, the foamed plastic segment is estimated to lead the aircraft insulation market in 2017. Plastic foams are widely used in cabins in seat cushions and mattresses to absorb heat, noise insulation, vibration, etc. The aerospace industry uses various materials, such as polyimide and polyurethane foams combining acoustic and thermal insulation to be used in aircraft cabin in linings and wall panels, and rest areas or insulation blankets for the door areas of the aircraft. Based on platform, the aircraft insulation market has been segmented into fixed wing and rotary wing. The fixed wing segment is projected to witness the highest growth during the forecast period. Rotary wing aircraft fly at a comparatively lower altitude than fixed wing aircraft. The aircraft insulation market has been studied for North America, Europe, Asia Pacific, and the Rest of the World. North America is estimated to lead the aircraft insulation market in 2017, as major aircraft insulation material manufacturers, such as DuPont (US), Triumph Group, Inc. (US), and Esterline Technologies Corporation (US) have their presence in the region. Low shelf life and issues with recycling of composite materials, backlogs of aircraft orders, and stringent regulations by the Federal Aviation Administration (FAA) for use of insulation materials can restrain the growth of the aircraft insulation market. Major aircraft manufacturers have a large number of orders for new aircraft due to the increased air passenger traffic across regions in recent years. However, limited manufacturing capacity of these companies has led to a large backlog of aircraft deliveries, which can also result in order cancellation. Products offered by various companies operating in the aircraft insulation market have been listed in the report. The recent developments section of the report includes information on strategies adopted by various companies between 2014 and 2017. Major players in the aircraft insulation market include DuPont (US), Triumph Group, Inc. (US), Esterline Technologies Corporation (US), etc. These companies have an excellent geographic reach and distribution channels.